These links are no longer active. Please visit the new PAsmart website for current information. Harrisburg, PA – Governor Tom Wolf today launched the next phase of his new and innovative PAsmart initiative by announcing that $30 million in grants are available to invest in K-12 computer science and STEM education, expand registered apprenticeships, and support job training with Industry Partnership programs. Over the next decade, seven in 10 new jobs in Pennsylvania will require workers to use a computer and an estimated 300,000 STEM jobs will be available in the commonwealth this year. Already among the nation’s best in STEM education, PAsmart provides competitive grants to bring high-quality STEM and CS education to classrooms in elementary, middle, and high schools, and professional development for teachers. 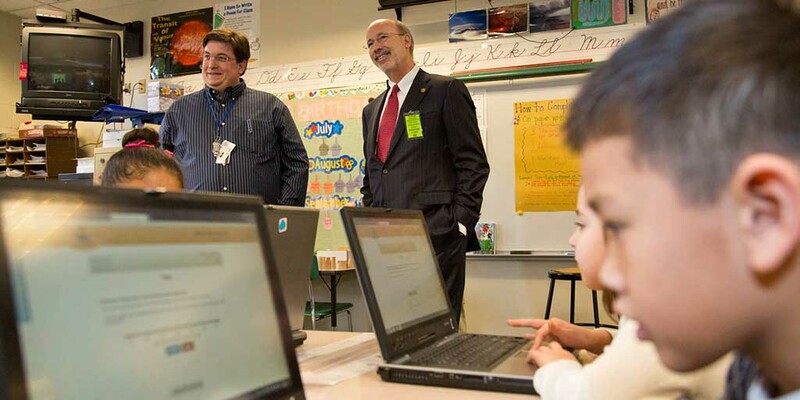 With this commitment, Pennsylvania now ranks second in the country for investments in K-12 STEM and computer science. PAsmart provides $20 million to increase access to STEM and computer science education for Pennsylvania students, with an emphasis on girls, minorities, and other underserved students. View frequently asked questions about PAsmart grants. Applications for target grants are due by December 14, 2018 and advancing grants are due December 28, 2018. Registered apprenticeships provide hands-on experience for students and workers to gain skills for employment or advance their careers while earning a paycheck from their employer. The Department of Labor & Industry launched the Apprenticeship and Training Office in 2016 to support and expand registered apprenticeship programs. Since then, the number of registered apprentices has increased by 26 percent to 16,832. PAsmart invests $7 million to develop and expand registered apprenticeships and support industry’s need for more skilled workers. Applications for all Apprenticeship Grants are due by December 21, 2018.
public-private partnerships cluster similar employers to enhance the regional workforce and economy. PAsmart provides a $3 million increase for Industry Partnership grants, for a total investment of $4.6 million. Applications for Industry Partnership grants are due by December 14, 2018.